When it's raining inside your house, there's never time to spare. You may not always be able to fix a leaky roof yourself, but you can take steps to mitigate the damage—and the cost of repair. Q: Help! I woke up after last night’s storm to find a discoloration on the kitchen ceiling and a puddle underneath. What do I do about this new leak? A: There’s nothing quite like an indoor puddle to put a damper on your rise-and-shine routine, is there? The first thing to do is mitigate any moisture damage. That can get complicated, since a leaky roof doesn’t always appear as a puddle on the floor (or at least not immediately). Occasionally, the only sign of a leak is a subtle discolored patch on your ceiling or wall, caused by water pooling behind it. When you’re lucky enough to spot it early on, intervene as soon as possible using the following steps. Secure the scene. 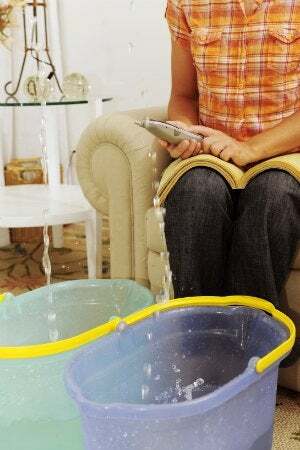 If water’s just dripping onto the floor, consider yourself lucky and move a bucket to catch the falling drops. (While you’re at it, save your sanity by propping up some scrap wood inside the container to mute the annoying drip-drip-drip sound.) If you’re dealing with more than mere drips, move as much as possible out of the water’s path and use thick plastic sheeting to cover items that are too heavy to relocate. Drain the water. Get up on a ladder or sturdy chair and puncture the water-damaged patch with a screwdriver. You may think that you’re making things worse by punching a hole, but if you skip this step more moisture will seep in. In fact, the weight of the water could even cause your ceiling to sag or collapse, adding one more repair to your growing list. Ultimately, patching up a small, 1/2-inch drainage hole is a lot easier and cheaper than dealing with structural damage. Start sleuthing. So, where’s the source of that pesky leak? Water travels down trusses or flashing until it finds a weak point, so the spot where the water’s entering the room isn’t necessarily underneath—or even near—the portion of the roof you’ll have to fix. If you have attic access, start by heading up there during daylight hours. Turn off the lights and look up to see if there’s any small opening that lets sunshine stream through—an obvious source for your leaky roof. Fight water with water. Can’t spot any signs of damage from the attic? Then your next step is the water-test method: Have someone stand outside on the roof and, using a lengthy hose, shower the roof in small sections until water starts dripping into the room again, giving you a second chance to pinpoint the source. Phone a professional. Sometimes, finding the source of a leak is more complicated than simply spotting a hole in your attic’s ceiling. From failing flashing to clogged gutters to crumbling shingles, the list of potential causes is very long. If you’ve conducted a thorough inspection and you’re still not certain what’s causing your roof to leak, it’s time to call in a pro to both locate the problem and recommend a fix. 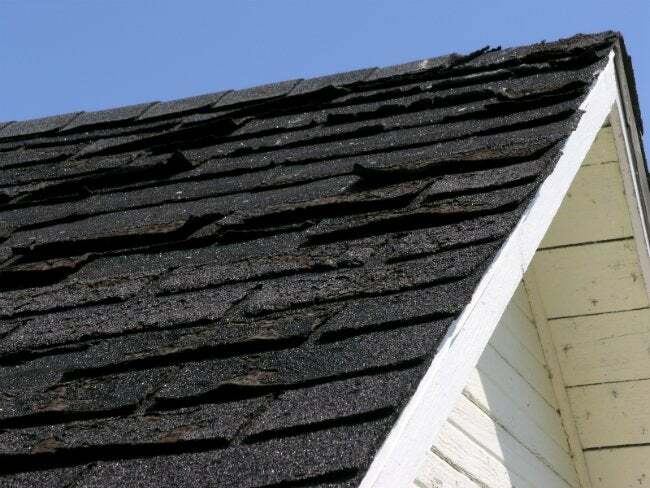 The actual repair will depend on many factors, including roof pitch and type of shingle. Meanwhile, lay out a tarp. If you’ve found the roof leak but can’t get a same-day repair, you’ll have to take temporary measures to protect your roof and home from snow, rain, and more water damage. If the roof is dry enough for you to climb safely, try covering the affected area with heavy plastic sheeting or a tarp (at least six millimeters thick) and some 2×4’s. Start at least four feet out from the problem area and slowly roll the plastic over it, past the the ridge of the roof, and four feet down the opposite side to cover the leaky portion completely. Place one 2×4 at the “top” of the tarp (on the opposite side of the roof) and one at the bottom (below the leaky spot) to weigh the tarp down. Fold the tarp back over each plank and fasten it to the wood with a staple gun. The bottom 2×4 should rest on an eave or against a fascia board. Lay a third 2×4 on the top board, which you’ve already wrapped in plastic sheeting, and secure it to the wrapped board with nails to help anchor the covering. Place more 2×4’s along the perimeter of the plastic if you’re worried about wind. While you’re working outside, remember: Proceed carefully and—unless you want to compound the problem with a few more leaks—do not puncture your roof by nailing or screwing boards directly to it.